Looking for heirloom tomatoes? Grafting them can produce a better plant. Grafting tomatoes is done for the same reasons that desirable apple varieties are grafted to a different rootstock: The result can be a disease resistant plant that produces tasty, old fashioned tomatoes. And this is something you can do at home. Or as a garden club project but you’ve got to start planning now. For best results you’d want to start seeds for both rootstock and the scion which is an heirloom of your choice. The rootstock variety is chosen based on its resistance to a specific disease that you’ve had trouble with, fusarium wilt, for example. There are a number of different methods available. The NCSU bulletin Grafting for Disease Resistance in Heirloom Tomatoes showing the 45 degree angle method is available online http://content.ces.ncsu.edu/grafting-for-disease-resistance-in-heirloom-tomatoes.pdf. It explains that the stems of both plants must be the same size for grafting so the planting dates for the rootstock and the scion will be determined independently by the length of their germination period. You may have to experiment with seeds in a damp paper towels to determine how long that is for each. 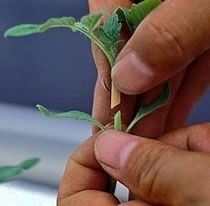 Grafting is performed when the seedlings have two to four true leaves and the stems are about 1/8” diameter. 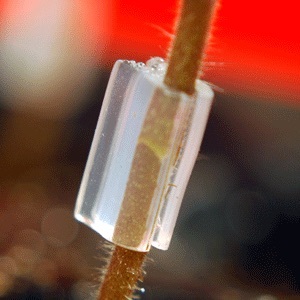 Matching 45 degree cuts are made and a special plastic clip holds the graft together. The tender, newly grafted plants go into a warm, humid recovery chamber in complete darkness for two to four days so a callous can form over the graft. The Bulletin has the program for gradually introducing your blue ribbon babies to the real world. Sounds easy but there are some key points: You need to get the right combination of rootstock and scion. Timing is critical as is sanitation during the grafting and recovery period. The stem of a newly grafted plant is very weak so it must be handled gently. And no overhead watering or strong breezes! The reward should be tasty heirloom tomatoes that don’t succumb to the blights of August.